Hanoi (VNA) – The Party Central Committee’s Office on August 8 raised 421 million VND (18,519 USD) to support locals in northern mountainous localities that have been hit by torrential rains and floods. Party General Secretary Nguyen Phu Trong, former Party General Secretaries Le Kha Phieu and Nong Duc Manh, as well as other former Party and State leaders and officials of the Party Central Committee’s Office donated at least one-day salary to the fund. 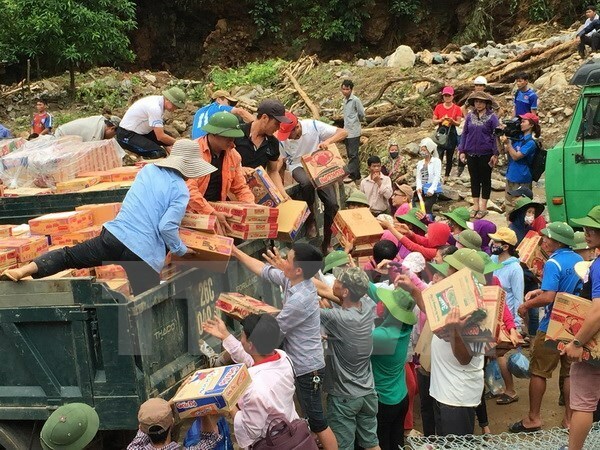 The same day, the Vietnam Fatherland Front’s Central Committee also called on State officials and public servants to contribute at least one-day salary to a fund as aid to the flood-hit localities. During the day, the VFF raised 105 million VND (4,618 USD), while receiving 50 million VND (2,199 USD) from the National Assembly Office and 450 million VND (19,795 USD) from the Ministry of Information and Communications for the fund. Hanoi has also offered 4.5 billion VND (197,955 USD) to assist the northern mountainous provinces. Recent heavy rains and flash floods have taken the lives of 26 people and left 15 others missing and 27 injured in northern mountainous provinces, mostly Yen Bai, Son La, Lai Chau, Dien Bien and Cao Bang, according to the Central Steering Committee for Natural Disaster Prevention and Control. Son La province had the highest number of fatalities with 12 while Yen Bai had the highest number of missing persons with 13. Torrential rains and floods also swept away and collapsed 231 houses, damaged 245 houses, submerged 338.5 hectares of rice, and made 398 households leave their homes to safer places.